My rice seedlings that I told you about last time are doing really great. The modified hoop house is certainly my best cheapo rice nursery solution to date, and I’m very happy with it. On a sunny day, even with temperatures outside in the 70s, entering the hoophouse will fog my glasses up. Tropical! On cloudy days the effect is less pronounced but all in all it is a nice environment for cold-climate rice seedlings. A couple of days we had sub-freezing temperatures and I have never been less worried about losing seedlings than this year. This is just the beginning of the list. The hope is that in the course of this trip from VT to the sea and back again that we will hold about 20 public markets. There are many more localities we are looking to stop at, and where confirmation is too many steps away I hesitate to list them. Still I am confident that many more venues will be added in short order. We’re delighted to be able to say yes, we’re coming back, and if you live along the route and have a burning desire for us to visit your local dock, then please get in touch! Our local partners and allies are totally essential to our success. Another opportunity to visit and engage with the project is our upcoming Dinner at the Falls in Vergennes, for which we still have 6 seats available. We had a fantastic time hosting this last August. The setting is perfect, the food awesome. 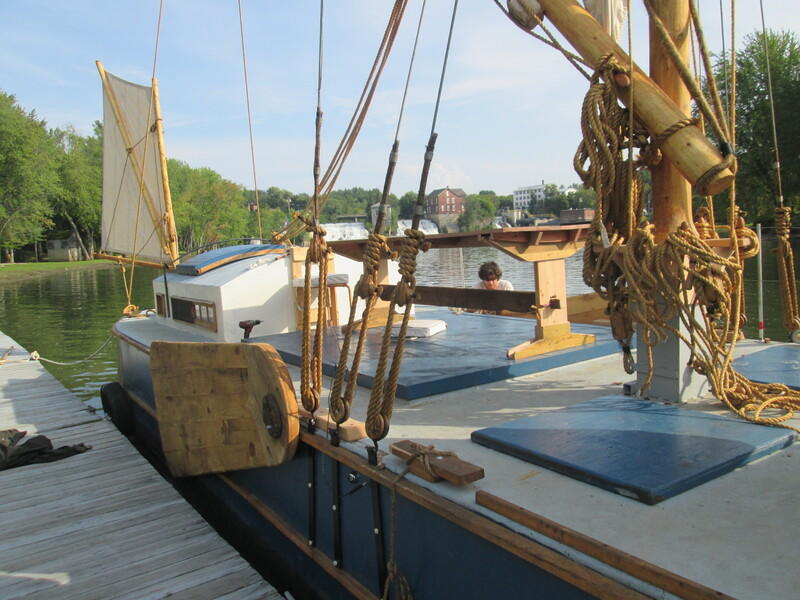 If you live up our way in Vermont please consider coming aboard for dinner and good conversation on Friday May 30th at McDonough Landing, Vergennes. Advance purchase of tickets necessary, $150 per couple. Proceeds go to support the nonprofit Willowell Foundation and VSFP. 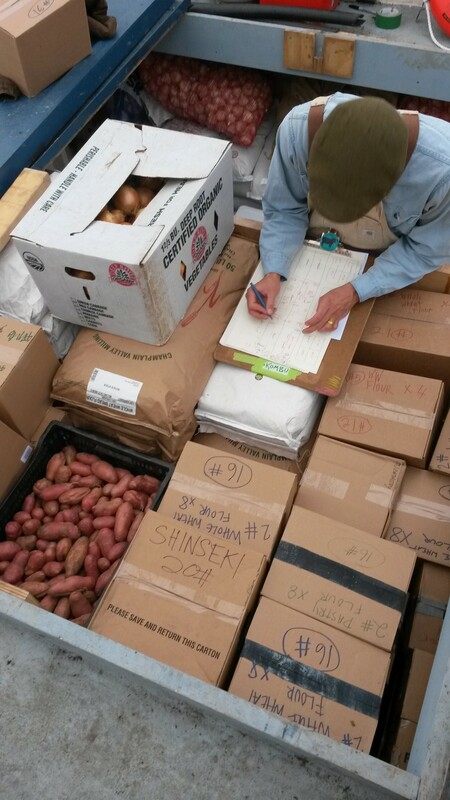 Now that the rice nursery is secure my attention is pretty much all on planning, coordinating this with the esteemed Andrew Willner who will be superintending this round-trip from on-board the barge in the capacity of Acting Director. In addition to planning are a number of small repairs and modifications needed to get Ceres ready for the water again in a few short weeks time. Structurally, she held up to the rigors of the last voyage faultlessly. So the improvements are mostly in the direction of improved cargo management and improved shipboard quality of life, with some attention as well to improvements of the sail rig. I hope to begin sinking my teeth into that work in the coming week and look forward to telling you about it all in detail in the next post. An almost unreal weather reversal in Vermont these last few days. Temps topped out over eighty on Monday. Yesterday the wind switched from south to north and brought with it an inch of snow! I am in the middle of getting rice planted, despite an early spring season which has offered very few decent days for working outside. The key project right now is getting our hoophouse rebuilt with better features to be a rice nursery. In northern climes, rice is typically started under frost protection and transplanted into the rice fields at 5-6 weeks old. At any rate that’s what we do. Today was to be my day to reassemble the hoops. But just now I went out in that north wind for about five minutes before calling it quits. I am actually not such a terrible wimp normally when it comes to weather, but 20mph winds with temps in the 20s turned out to be more than I could make myself tolerate on the 16th of April. Nevertheless, one way or another, the rice is getting planted out by Friday. By then the temperatures will have moderated a lot and the projection from there is pretty favorable. For right now, the unpleasant (I wrote “foul” but then went back on it. It’s not foul, just a little inconvenient) weather provides all the prompting I need to sit inside and write a nice long post. Snow and ice in the rice nursery on April 16th! So what about Ceres you might ask? She is still parked under the pole barn where we built her, also waiting for the spring, as you can see. We have been planning and scheming these last few months, and now emerge with a plan to take our sailing barge south again in less than 10 weeks time with a new load of cargo. We hope to revisit Mechanicville, Hudson, Kingston, and other points, while making our way to Croton by June 18th where we will be hosted by Ferry Sloops at Shattemuc yacht club, offering an up-close view of our barge and goods for sale. From there we take a short hop across Croton Bay to participate in Clearwater Revival, on June 21st and 22nd. We are extremely excited about participating in this festival celebrating Pete Seeger’s legacy in the Hudson Valley. We plan to offer goods for sale at the festival’s artisanal farm market and also to offer information on the project at the working waterfront exhibition area. Beyond that the plan is still a little hazy, but it is likely we will head back to the northern part of our route to acquire more cargo from farms, with hopes to return to the south by July 12th to participate in the Metropolitan Waterfront Alliance‘s City of Water Day. Our 2014 crew is really coming together! VSFP is proud to be working with the MiddCore Plus program at Middlebury College, and Meade Atkeson will be joining the crew as Ceres resumes trading. Also, 2014 Binghamton University graduate Matt Horgan will be coming aboard for the June voyage. Steve Schwartz has expressed interest in returning as our capable skipper, though this is yet to be confirmed. Lastly, Andrew Willner, former New York / New Jersey Baykeeper will be holding the reins of the project for the first part of the season in the capacity of Acting Director. Were you wondering how I was going to keep that rice growing while going down the river in June on a sailing barge? Well, this is my answer — I’m staying behind in the mud with my plants and leaving the adventuring to others this time.